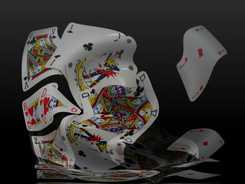 Is a variation of five-card stud, based on three player cards and two community cards. The two community cards are initially dealt face down. 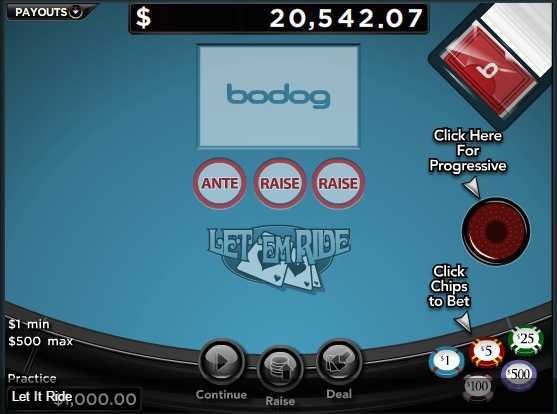 The most distinguishing feature of Let It Ride is that the player is given two opportunities to withdraw exactly one-third of their initial wager. One chance occurs after the player looks at their hand but before the first community card is revealed, and the second occurs after the first community card is revealed, but before the second is revealed. 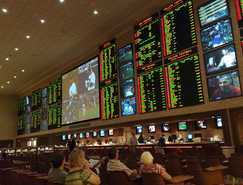 The player may reduce their wager on either of these occasions, or on both, or neither. If the player decides not to withdraw part of their wager, they are said to "let it ride".In the event of a winning hand after the second community card is revealed, what remains of the player's wager is paid out according to a payout table such as the one given below. 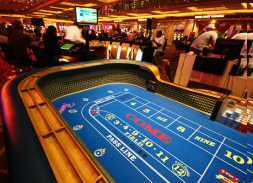 There are small variations in payoffs between casinos, but the lowest paying hand in Let It Ride is typically a pair of 10s; a pair of nines or less is a losing hand, which results in the player forfeiting their remaining wager to the house.